Logan looks like Sophie now, well almost like Adeline, who is pushing 28 LBS at 1 year. That is a flashback, I remember our first wandertag ( the first family outing) b/w the D’s and the P’s and that John had a backpack for Logan. How time flys! 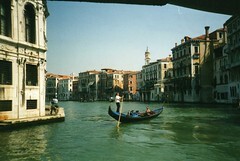 Funny – the first time my hubby went to Venice it was with your hubby. Also, something about it being ‘for work’, but I do distinctly remember a story about crashing through a gate into a private party trying to get a way back to the hotel since none of them were reallly thinking clearly due to all the DRINKING!! Logan was so little there . . . amazing how she changed before our eyes in just four short year! Tom and Elva are in Venice so it is funny to read so much about it . . . wish I would have spent another day there on my Italy trip . . . maybe next time!